Daniel Boone became one of America's first folk heroes. His exploits as a woodsman were legendary. He was an expert hunter, marksman, and tracker. He led the exploration and settlement of Kentucky. Where did Daniel Boone grow up? Daniel grew up in a Quaker home in Pennsylvania. His father was a farmer and he had eleven brothers and sisters. Daniel worked hard on his father's farm. He was chopping wood by the time he was five years old and was taking care of his father's cows by the time he was ten. Daniel loved the outdoors. He would do anything not to be cooped up inside. While watching his father's cowherd, he would hunt small game and learn to find their tracks in the woods. He also became friends with the local Delaware Indians. They taught him a lot about surviving in the woods including tracking, trapping, and hunting. Daniel soon began to dress like the Indians. About the age of thirteen, Daniel got his first rifle. He had a natural skill at shooting and soon was the main hunter for the family. He often went off on his own for days hunting. He would kill foxes, beaver, deer, and wild turkey. In 1751 the Boones moved to Yadkin Valley in North Carolina. Daniel hunted enough animal skins to help his family buy 1300 acres of land. He became known as the land's best sharpshooter winning all the contests he entered. The French-Indian War began in 1754. This was a war between the British colonies and an alliance of the French and the Indians. Daniel joined the British army where he worked as a supply-wagon driver and a blacksmith. He was at the Battle of Turtle Creek where the French-Indian forces defeated the British easily. Daniel managed to escape on horseback. Daniel returned to North Carolina and married a girl named Rebecca. They would have ten children together. Daniel met a man named John Findley who told him about a land west of the Appalachian Mountains called Kentucky. In 1769 Daniel Boone made an expedition into Kentucky. He discovered the Cumberland Gap, a narrow pass through the Appalachian Mountains. On the other side, Daniel discovered a land that he considered a paradise. There were meadows for farmland and plenty of wild game to hunt. Daniel and his brother John stayed in Kentucky to hunt and trap furs and pelts. However, they were soon captured by the Shawnee Indians. The Shawnee had agreed with England that the land west of the Appalachians was theirs. They took Daniel's furs, guns, and horses and told him never to return. 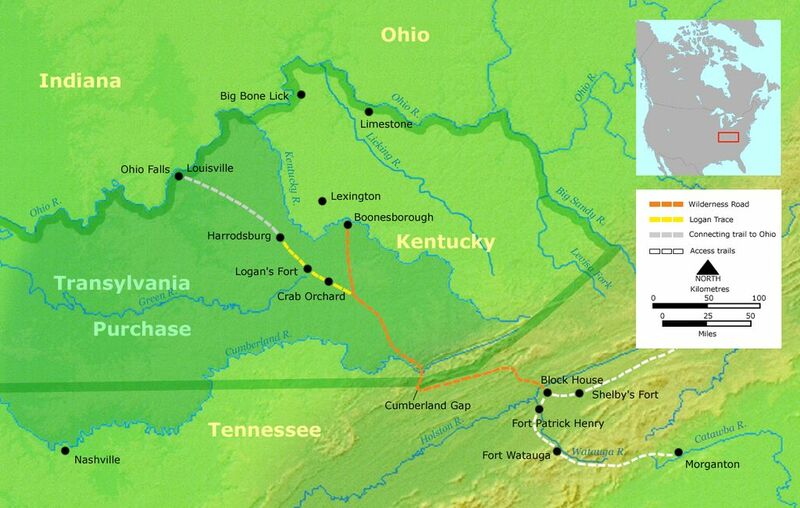 In 1775 Daniel made another expedition into Kentucky. He and a group of men helped to build a road to Kentucky named the Wilderness Trail. They chopped down trees and even built small bridges for wagons to pass through. Daniel worked the next three years building a fort and starting a settlement called Boonesborough. He brought his family there and settled down. However, things were not easy for Daniel and his family. The Indians did not want the settlers on their land. They attacked the fort regularly. One time, Daniel's daughter Jemima was kidnapped and Daniel had to rescue her. Even Daniel was captured once, but managed to escape. Eventually, Boone and his family left Boonesborough. They lived in West Virginia for a time and then moved to Missouri. Daniel enjoyed hunting and the woods until the end of his days. Daniel likely never attended school. He learned to read and write at home. However, he enjoyed reading and often took books with him on the trail. When Daniel was still just fourteen years old, he spotted bear tracks near his father's herd. He tracked the bear down and killed his first bear. Boone's rifle was given the nickname the "Ticklicker" because it was said that he could shoot the tick off of a bear's nose. One of his nicknames was the Great Pathfinder. In 1784 a book was written about Daniel called The Adventures of Col. Daniel Boon. It made him a folk hero (even though his last name was spelled wrong).